What's up with our peas? 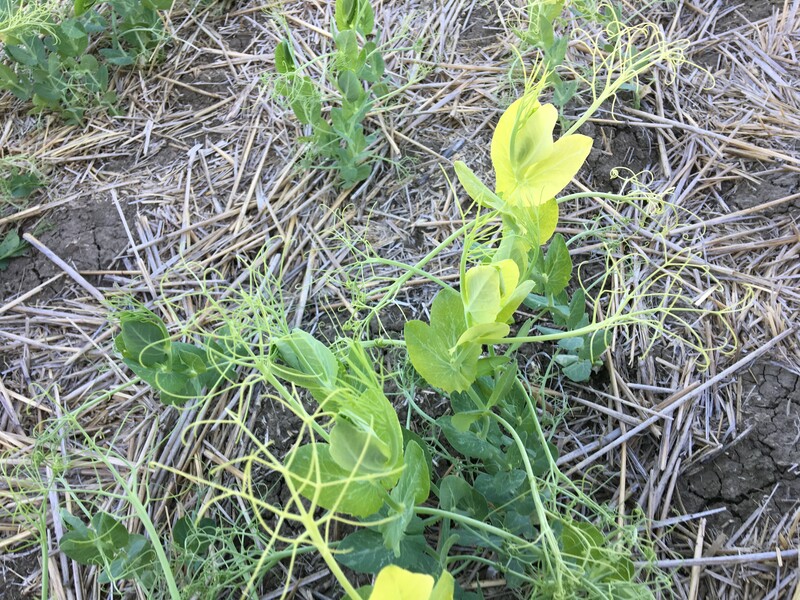 Forum › Pulse & Special Crops › What's up with our peas? What's up with these peas ? Peas are very susceptible to PH of soil, only taking a stab in the dark. Jun 22, 2017 | 12:56 4 I have a bit of that caused by Viper damage. Note that you really notice it in any overlap areas. Check roots but i have not seen any root rot in our area. I also notice that some of the nodules are just now turning red so could be N deficiency issues. I am not worried about mine and waiting. Jun 22, 2017 | 12:57 5 Maybe furrow will hazard a guess but I would dig that yellow one up....not sure you will like what you see. Jun 22, 2017 | 13:09 7 Newest leaves are yellowing so not a N issue now that i think a little more. I don't know anything about field peas but picture looks like it's wheel tracks from seeding. Could it be compaction from wet conditions. Lack of adequate root system? Granular Innoculant not metered out quite right? Steaky appearance in the picture would seem to indicate to me its not environmental (except for possibility of compaction as suggested earlier) but rather mechanical? Chemical over application in those strips maybe this year or last year. Lots of residual damage showing up this year. Last edited by biglentil; Jun 22, 2017 at 14:07. 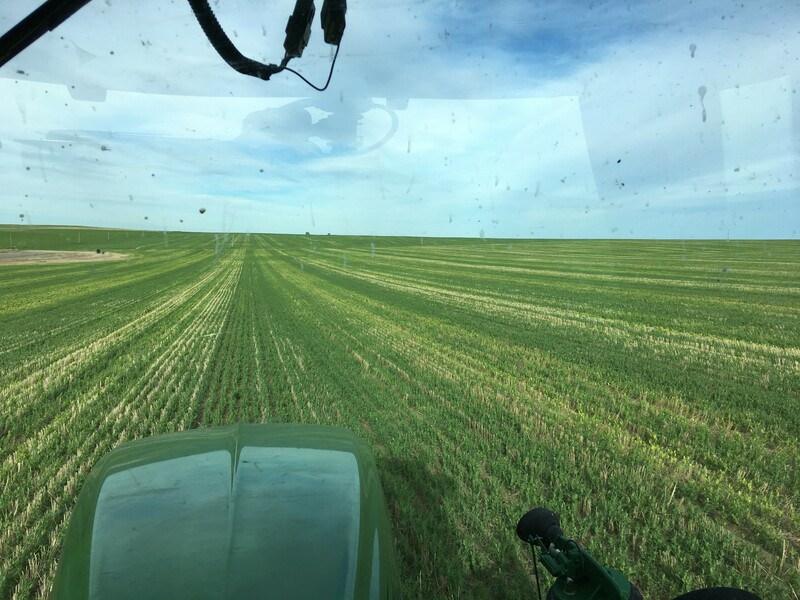 Jun 22, 2017 | 15:37 13 Fellows, I think the color difference you see from the sprayer seat looks more like standing stubble versus flattened stubble from field operations. Other than that I don't have an explanation either for the other picture other than what other people are suggesting. 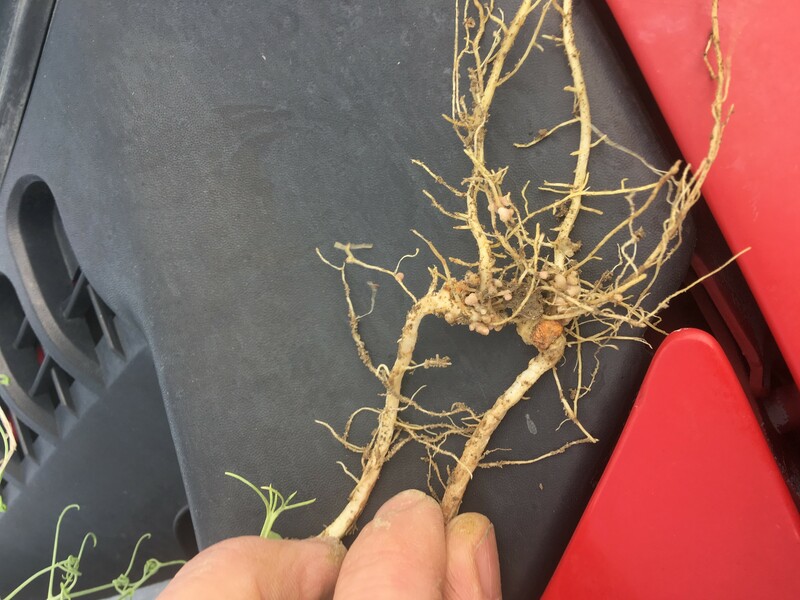 Spray overlap, poor nodulation, disease, I doubt it's herbicide flash because the all other ones don't have the symptoms. Is it happening in the places of heaviest trash? Innoculant with polymer coating? Application misses? How dry have you been? 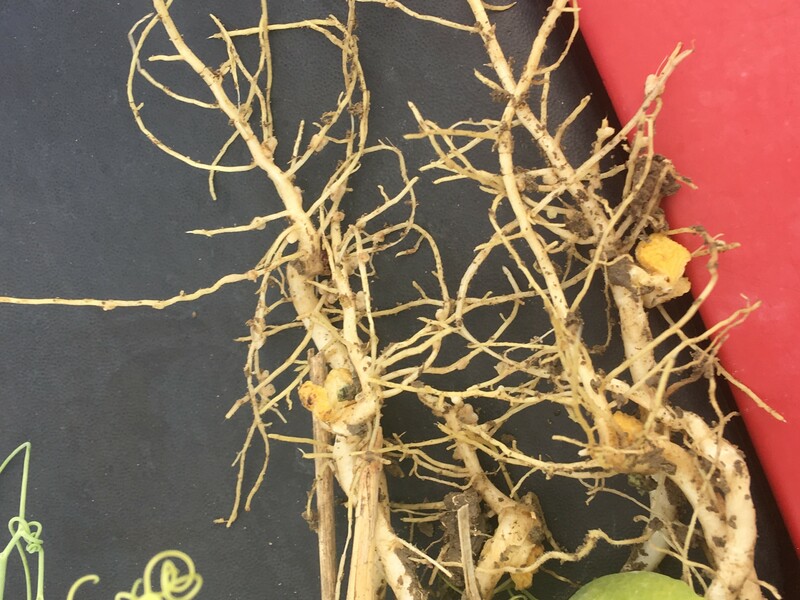 Did you check for nodulation(green plants versus yellow)? Last edited by farmaholic; Jun 22, 2017 at 15:50. Jun 22, 2017 | 16:17 16 Had similar event a few years ago in no till field. The previous years depression in tracks caused a segment of the next years drill to go 1 inch deaper and did the same thing was it dry originally? Jun 22, 2017 | 16:42 18 If it was good on lentil stubble and not cereal stubble i wonder if you don't have nitrogen immobilization in chaff rows behind combine. This will fix itself once the nodules kick in which seems to be happening right now on my peas. And once microbes run out of stubble to eat, they die and release the N back into soil and problem solved from either standpoint. But, this issue should really be on older pea leaves as mentioned above. Saying that, all our peas are on lentil stubble this year so our fields are not really comparable. We used to N on our peas, only P.
Same issue with soybeans, too much straw left behind the combine. You can clearly see where last years windrows were. I always heavy harrow cereal straw to avoid this. Jun 22, 2017 | 18:03 23 I would say Dave is right . Here the more stubble the more the yellowing as well. Jun 22, 2017 | 18:05 24 Let er go , let er grow. Adding anything to that situation would be a waste of money . Root system is healthy thats key . Jun 22, 2017 | 18:23 25 Got a Brix meter today and have been trying it out a bit. Getting a Brix reading of 10 in healthier looking Peas and 7 in the pea plants that are yellow. Checked out some durum and getting readings of 10-12. Any one have much experience with a Brix meter? Jun 22, 2017 | 18:27 26 Absolutely great thing to have . 12 plus is perfect . If the whole field was 7 ish , 2 litres of alpine would kick er up. But your field should correct itself as Dave said. Jun 22, 2017 | 21:43 27 What is the idea behind a brix meter? Tells you the sugar content of the plant? Jun 22, 2017 | 22:40 28 My peas look like that also in wetter clay areas of field. Yellow tops of plants suggests sulphur deficiency. Perhaps try some foliar S.
Jun 23, 2017 | 06:27 29 I am no expert on Brix testing but here is some info I found on line. Brix testing involves using a hand-held device called a refractor to make a visual reading on the sugar content of plant material. The test actually refers to the total amount of soluble solids, that is, sugars along with plant proteins, vitamins, and minerals. A Brix reading lower than 10 tells the farmer that the plant lacks nutrients. The desirable reading is 13, which indicates a robust and nutrient-rich plant. To measure the Brix a refractometer is necessary as well as a method of extracting the juice from the plant. The optical refractometer uses daylight passed through a glass prism to measure Brix. The reading is read through an eyepiece, and the user measures the refracted light angle on an optical scale. To obtain juice/sap samples some people use garlic presses. What kind of Peas do you have in this year?